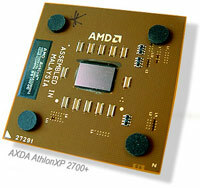 Abstract: Today, AMD is releasing the new AthlonXP 2700+ at 2.17GHz, and AthlonXP 2800+ processor at 2.25GHz. NOTICE: There will be a Web Cast on AMD.com at 11:50AM today to announce the new Chips. AMD came out with their guns blazing for the August announcement of the AthlonXP 2400 and 2600+ even though it was largely a paper release. The new chips brought the company to the forefront of performance once more, and with today's release of the AthlonXP 2700+ and XP 2800+ processors, AMD is "upping the ante" against big blue Intel once more. Our look at AMD's AthlonXP 2400+ told us that the new Thoroughbred core revision was an excellent performer, and that AMD was back within grasps of the processor performance crown. Today, AMD is releasing the new AthlonXP 2700+ at 2.17GHz, and AthlonXP 2800+ processor at 2.25GHz. This is more than just a simple speed blip on the radar screen though, both the AthlonXP 2700+ and AthlonXP 2800+ run on a 333MHz Front Side Bus! By all accounts, the AthlonXP processor has been due for a FSB boost for a long time now, and there have been a few signs that this was in the works. As our PCstats Newsletter Columnist Chris Angelini hinted to a few months ago, the new nVidia NForce 2 chipset arrived with support for 333MHz socket A processors - making the transition more of a waiting game, than a total surprise. Prior to the 333MHz FSB upgrade, the incremental clock speed increases were starting to level off in terms of performance increases. Basically, the 266MHz FSB was becoming a bottleneck for what the rest of the processor could scale to. Boosting the FSB from 133MHz (266MHz) to 166MHz (333MHz) gives new life to the AthlonXP and much loved DDR memory combo. The 0.13 micron manufacturing problems that AMD had earlier in the year appear to be all gone, and we're finally starting to see AthlonXP 2400+ and XP 2600+ show up on Dealtime, PriceWatch and other large online retailers. According to AMD, the AthlonXP 2700+ should be available for retail sale by early November for around $340USD. The AthlonXP 2800+ will be in the hands of the OEM's by the end of this year and will probably fetch prices of around $397USD in the retail market sometime early Q1 2003. Since there's no Packaging difference, the AthlonXP 2700+ is still socket 462 compliant. So what else is different about the AthlonXP 2700? 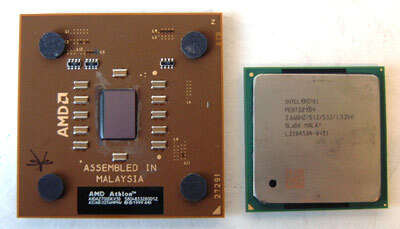 Architecturally, there's no difference between the AthlonXP 2400+, XP 2600+ and the new 333 MHz based AthlonXP's. The new 333 MHz processors are (obviously) based on the newer Thoroughbred Revision B core which uses a 9th metal layer to improve signal strength. The AthlonXP 2700+ contains 37.6 million transistors, the same as the 2400+, and is manufactured at AMD's FAB 30 in Dresden Germany. By default both processors use a 1.65volt VCore. The AthlonXP 2700+ uses a 13x multiplier to run at a true clock speed of 2.16GHz (13 x 166 MHz = 2158 MHz) while the AthlonXP 2800+ uses a 13.5x multiplier and has a real clock of 2.25 GHz (13.5 x 166 MHz = 2241 MHz). With the added bandwidth available from the higher bus speed and higher overall clock speed, AMD will seriously challenge Intel for the overall performance crown. Since these two new AthlonXP's run at a higher FSB, users with older motherboards may not be able to make the transition. Currently, the only chipsets that are validated to run with the new 333 MHz based Athlon's are; the VIA KT333, VIA KT400 and nVIDIA's nForce2. Older chipsets such as the AMD 760, VIA KT266A, VIA KT133A and SiS735 do not have the proper dividers which would allow for the AGP and PCI's to run at their designated speeds (66 MHz for AGP, 33 MHz for PCI). If you do plan to run these processors at 166 MHz on an older motherboards it will work, however you will be severely overclocking your AGP/PCI peripherals (88 MHz AGP, 44 MHz PCI) and they may get damaged. Up next, we overclock the AthlonXP 2700+ to 2.5GHz!